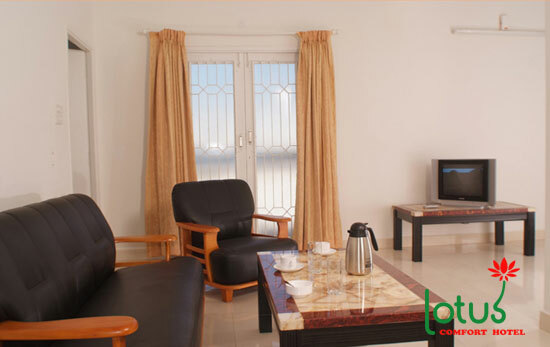 Lotus Comfort Hotels bring the Lotus Suite Service Apartments in Pondicherry that lies near the Ajanta Theater, on the East Coast Road. Close to major traveling hubs like the Chennai airport (160 km), the Pondicherry Railway station (3 km) and the Bus stand (3 km), Lotus Suite Service Apartments offer ease of commuting for guests and visitors. The convenience of location makes Lotus Suite Serviced Apartments offer easy access to the heart of Pondicherry. Famous tourist places near the apartments, like the Aayi Mandapam, Aurobindo Ashram, Bharathi Park and Dumas Church are not to be missed. Auroville is another important tourist spot in the city that often grabs the attention of visitors. Currency Exchange, Backup Generator, Travel Counter, Room Service, Laundry Facilities, Wedding Services, Recreation, Airport Transportation, Breakfast Services, Banquet Facilities. Bathrobes, Voicemail, House Keeping, Smoking Rooms, Reading Lamps, DVD Player, H/C Water, Bottled Water in Room, Toothbrush/Razor on Request, Safe Deposit Locker Facility. User reviews for "Lotus Suite Serviced Apartment Pondicherry"